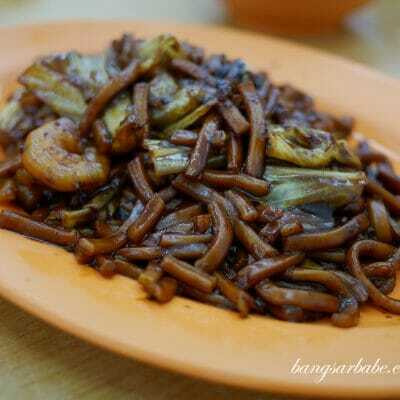 You get a choice of mee, mihun or kuay teow. 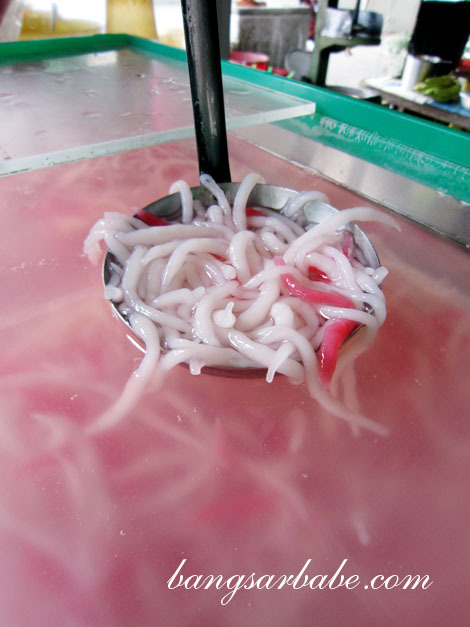 I generally like kuay teow, but for maximum satisfaction, go for the vermicelli and ask for “kar liu”. 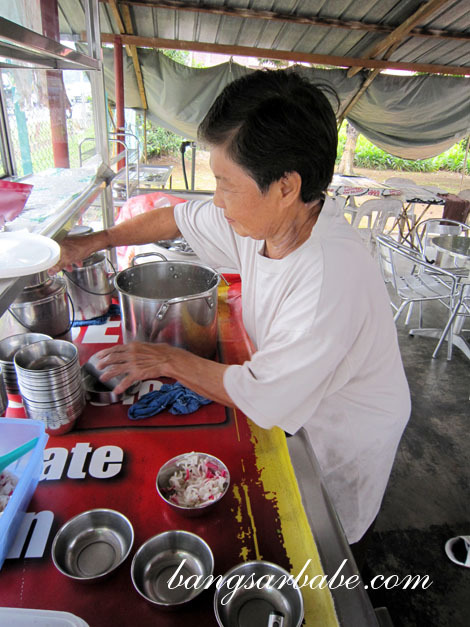 Read my blog post on Kuay Teow Th’ng here. 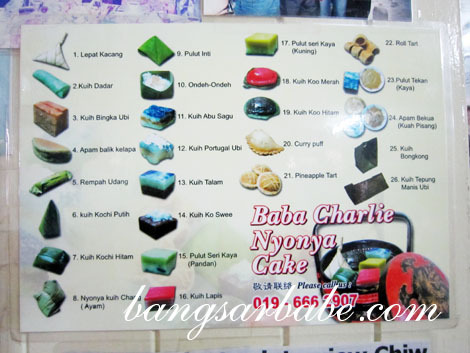 In my opinion, Baba Charlie makes one of the best Nyonya Kuih in Malacca. 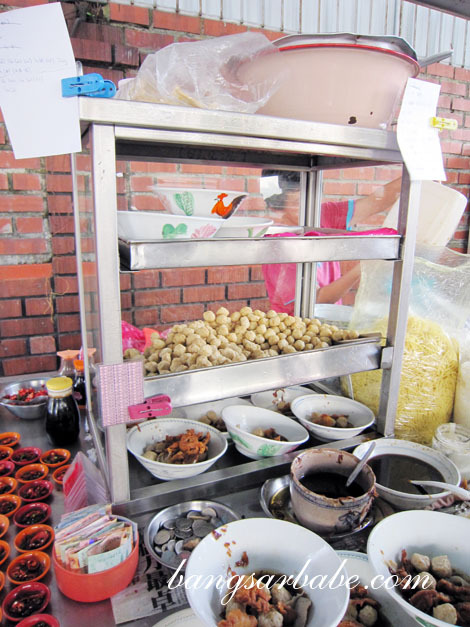 One of my favourite things to eat here is the Kuih Bongkong (RM0.80). 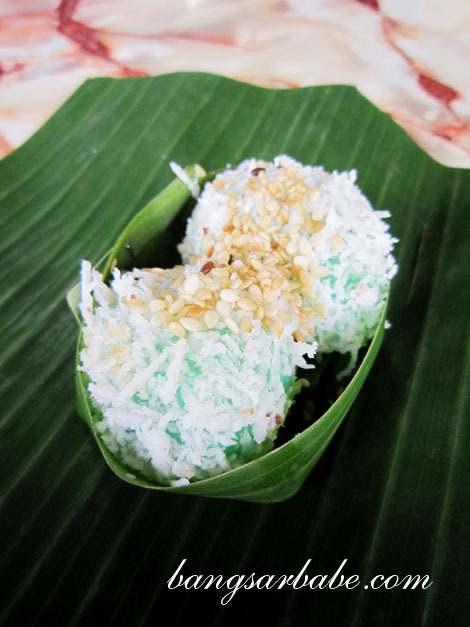 Kuih Bongkong has a smooth and silky texture – almost like the texture of a bean curd – and is eaten with Gula Melaka. 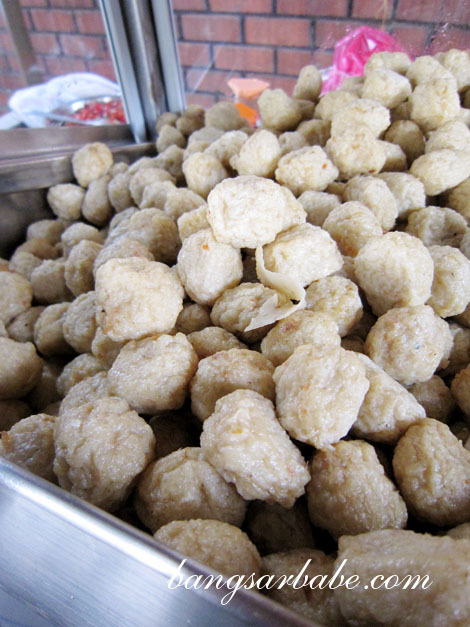 They also sell a mean onde-onde; freshly made and large in size with a generous amount of Gula Melaka. 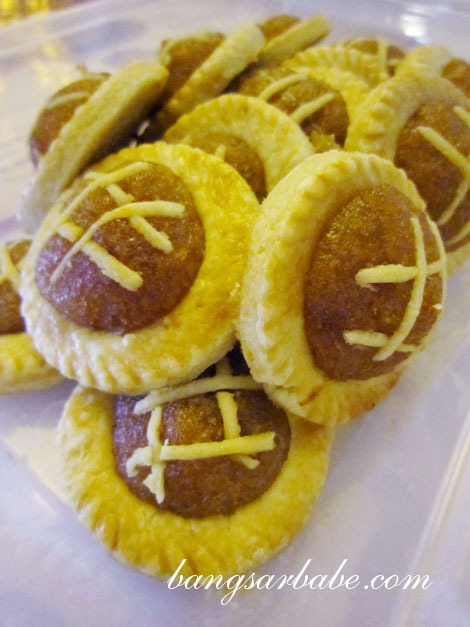 Pop in into your mouth and let the brown sugar syrup ooze out. 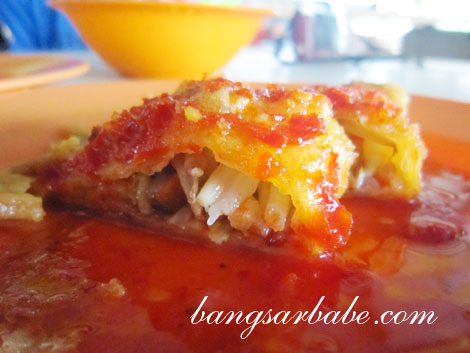 #shiok If you’re a fan of Kuih Ketayap, give Baba Charlie’s version a try. 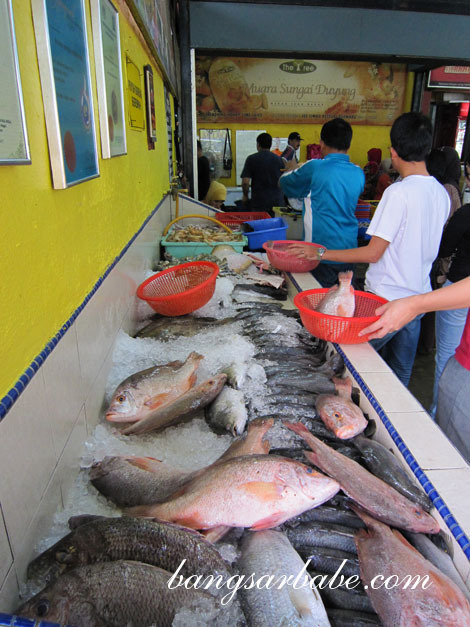 I usually buy 3-4 pieces for myself when I’m in Malacca. Read my blog post on Baba Charlie Lee here and here. Our friend and rif’s Malacca guide (also called Ken) took us for some Nyonya food prepared by a former hotel chef in Malacca. 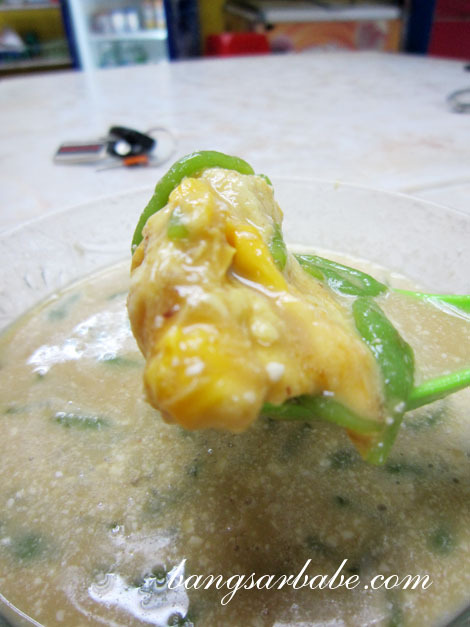 I didn’t care much for the chicken curry devil and otak-otak, but the ikan cencaru sumbat goreng was very good. 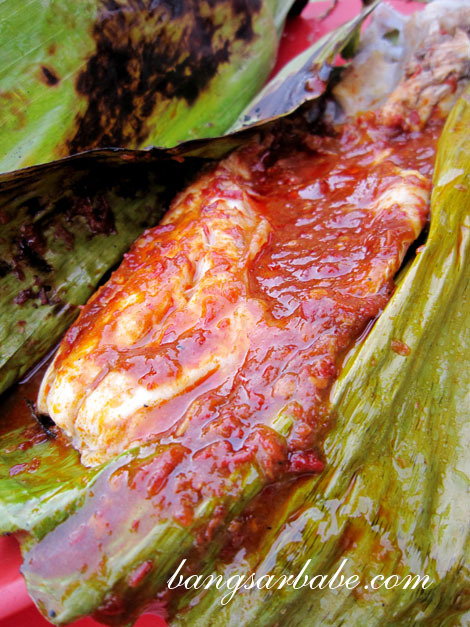 The sambal and rempah was aromatic and packed a punch, giving the fish a richer flavour. 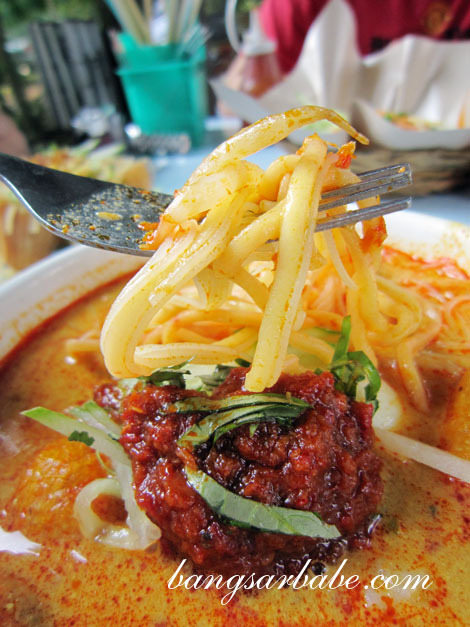 The Nyonya laksa was just alright in my books. 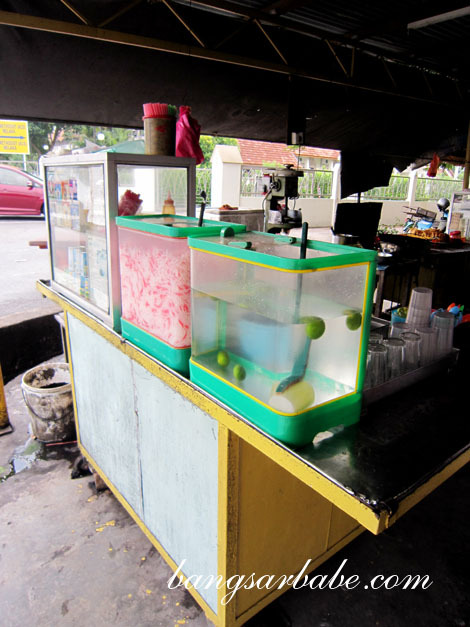 The cendol (RM2.50 – small, RM3.50 – large) is top-notch. 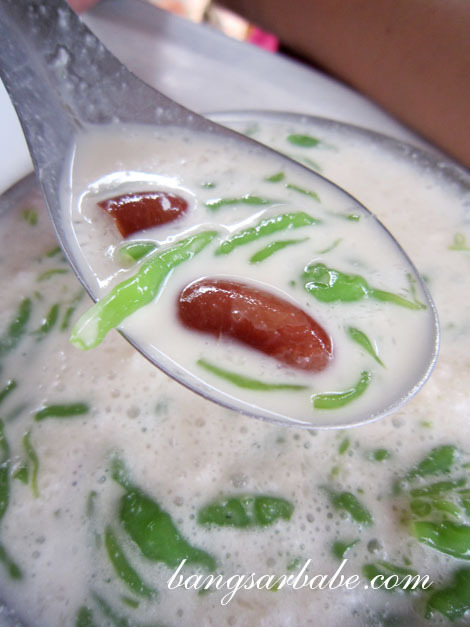 I have never eaten cendol this rich before. 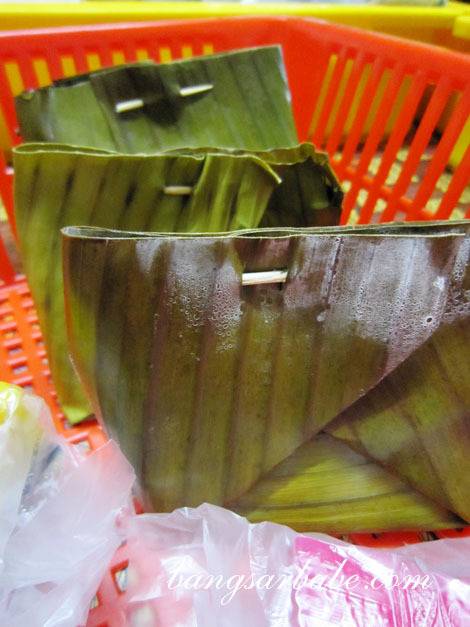 The green starch noodles were redolent of pandan leaves extract, while the lusciously thick and fragrant Gula Melaka left a lingering sweetness in my mouth. 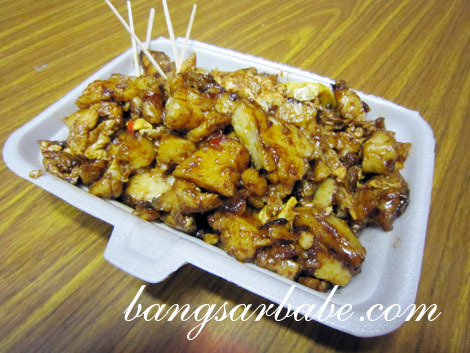 Tai Bak is also available, but I’m not a fan. Ken, the other Ken and rif liked it though. 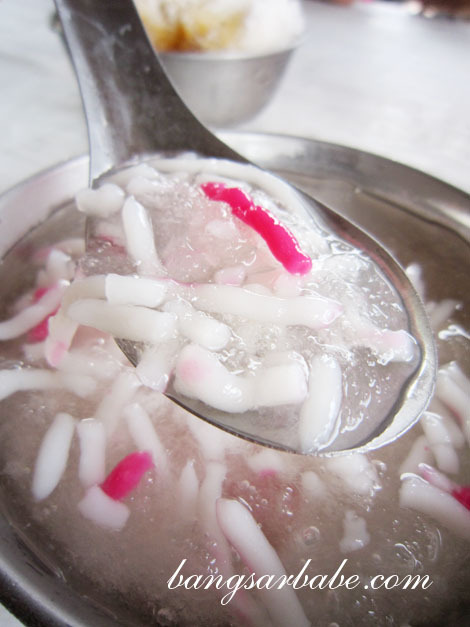 Read my blog post on Aunty Koh’s Cendol and Tai Bak here. 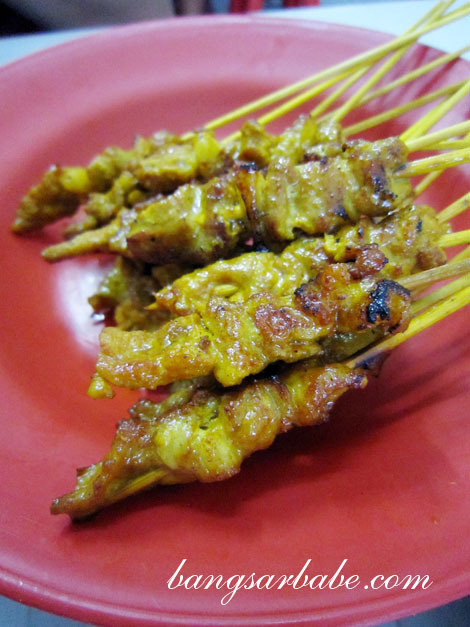 This satay boasts just the right balance of meat and fat, and the combination of well-marinated pork chunks and pork fat melts in the mouth. 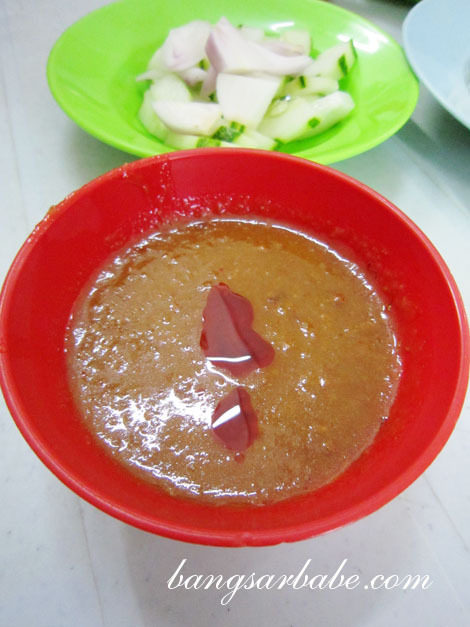 I like the peanut sauce here as chopped pineapples are added, resulting in a sweeter and tangier gravy. 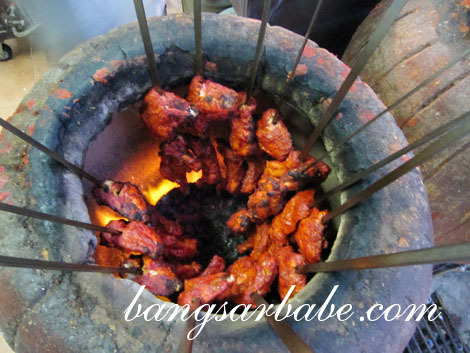 Read my blog post on Xiang Ji Pork Satay here. 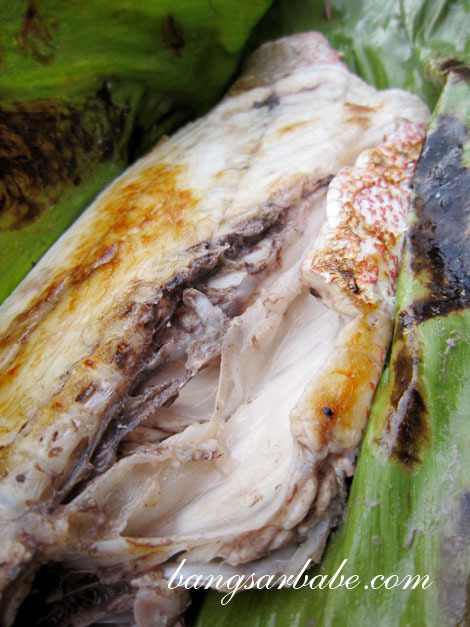 What’s so good about a coconut shake, you ask? Given the crazy weather, an ice cold cup is god-sent. 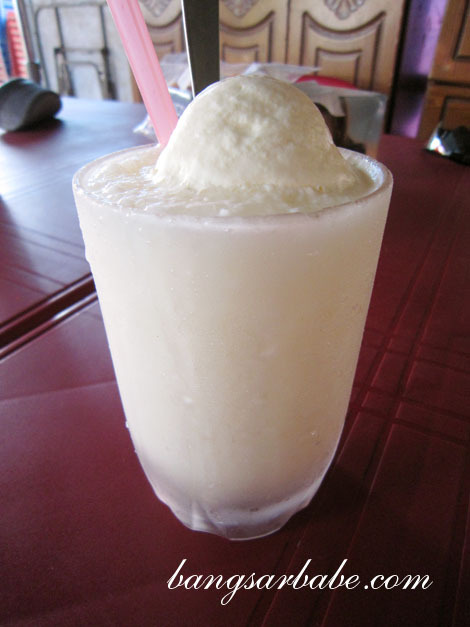 Coconut flesh and coconut water is blended with ice cubes and some vanilla ice cream. If you opt for the special version, you get a scoop of vanilla ice cream on top. Refreshing, really. 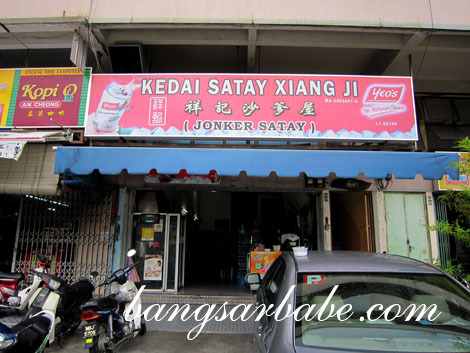 Read my blog post on Klebang Coconut Shake here. 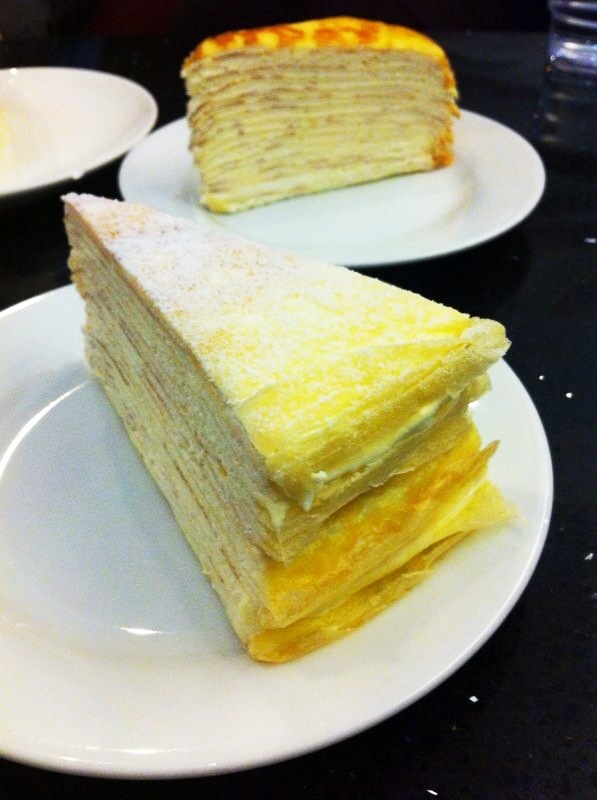 Read my blog post on Nadeje Patisserie here. 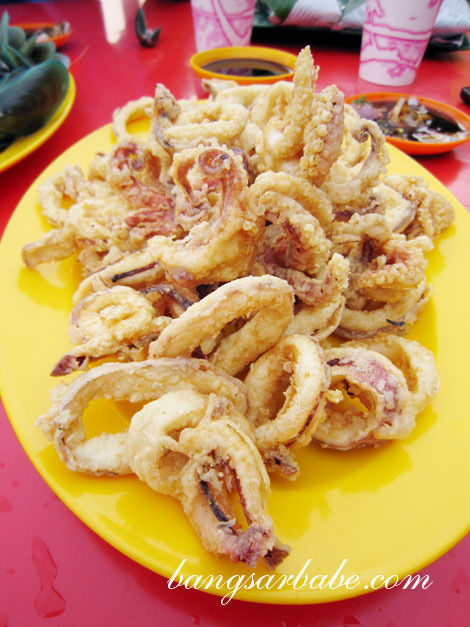 We tucked into individual packets of nasi lemak, fried sotong, kepah masak halia and fish, cooked two ways. While you can’t go wrong with fresh seafood, the thing that differentiates this place from the rest is the special dipping sauce. 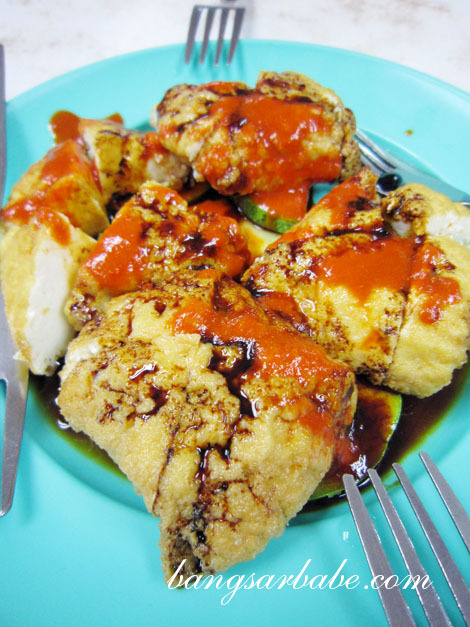 Made with sweet soy sauce, belacan, cili padi, onions and lime juice, this tangy, sweet and savoury combination went well with the seafood. 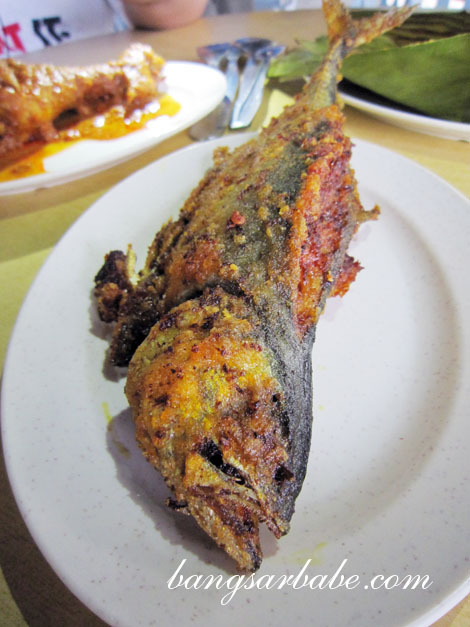 Read my blog post on Medan Ikan Bakar Muara Sungai Duyong here. We shared two chicken leg tandoori (RM7 each), “Jason” naan and garlic butter naan. 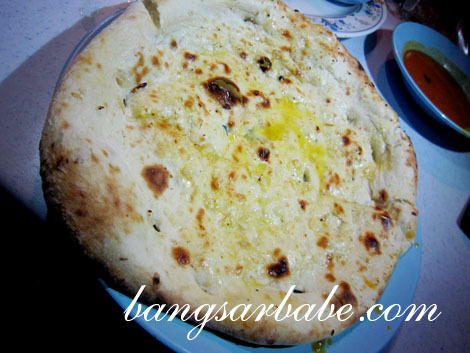 “Jason” naan comprised onions, garlic, cheese, egg and butter – good stuff! The tandoori was as delicious as people claimed it to be. Generously seasoned and tandoor-ed till tender perfection, I almost wanted to order another portion for myself. 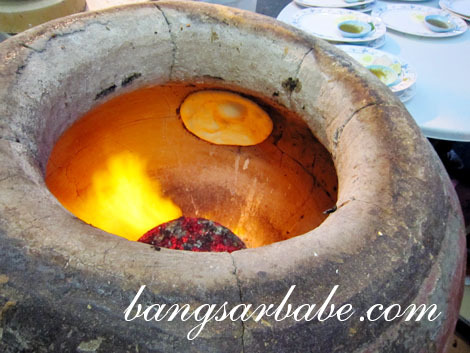 Read my blog post on Pak Putra Naan & Tandoori here. 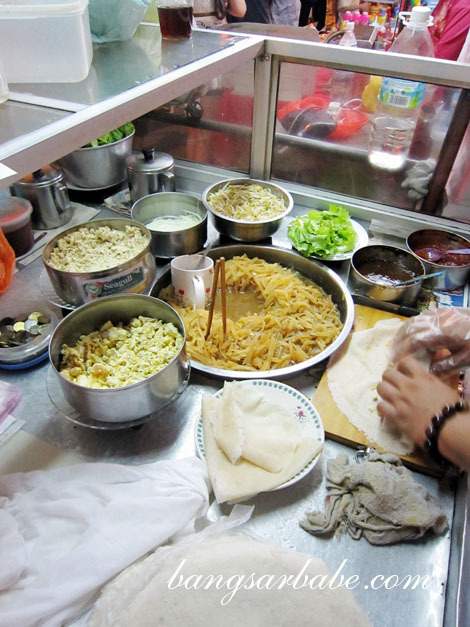 This popiah (RM2 per roll) comprise fried sengkuang, beansprouts, fried shallots, cabbage, lettuce, diced tofu, shredded egg, Malacca sweet sauce and chunks of pork lard. 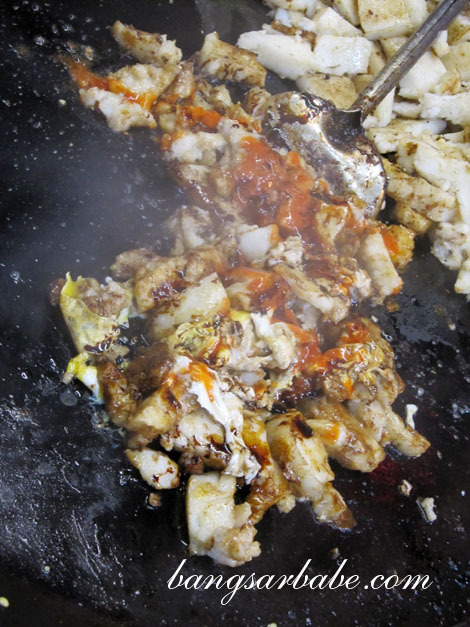 Fried carrot cake in Malacca comes with garlic, pork lard and black sauce. 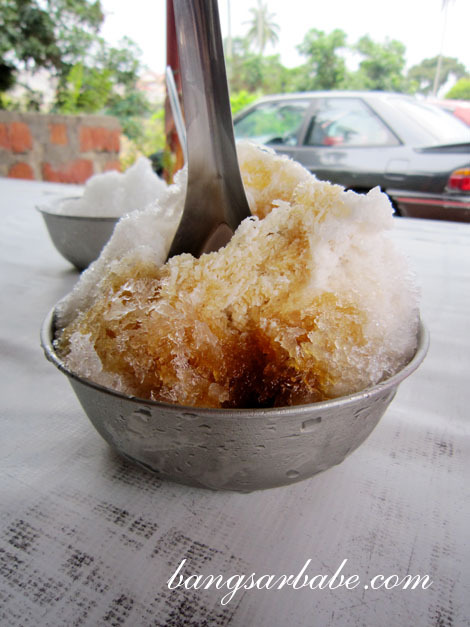 If you’re accustomed to the Penang or KL version, you’ll be in for a shock. 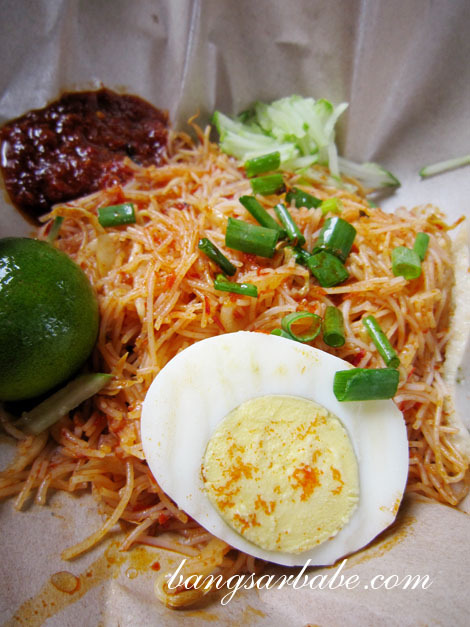 The Malaccan version has no bean sprouts, preserved vegetables or chives. 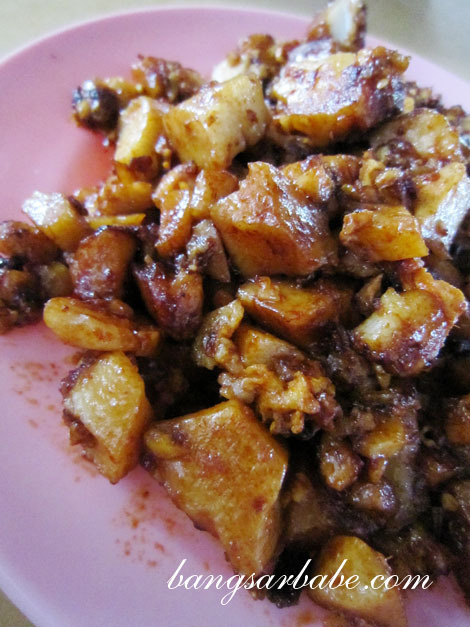 By the way, this fried carrot cake is rif’s favourite. 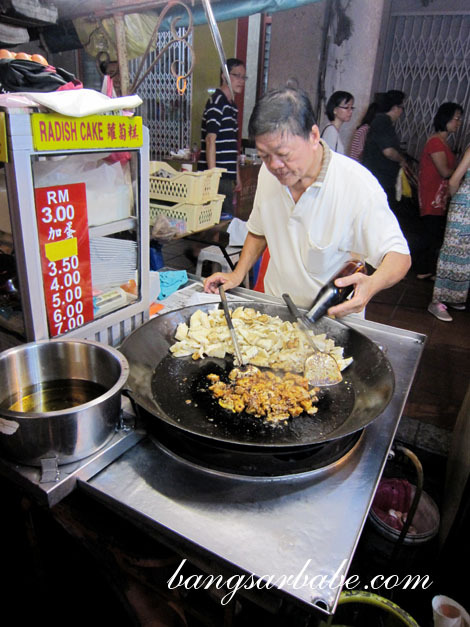 The uncle is stationed at Jalan Tengkera in the afternoon and sets up stall at Jonker Street at night. 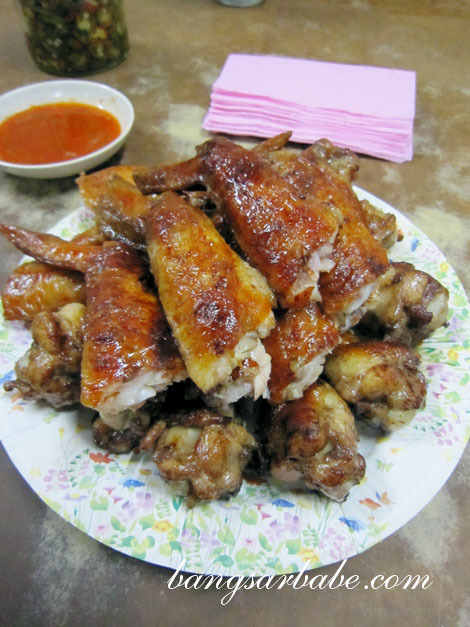 9.30pm: Duck web & wings, Jonker Street. 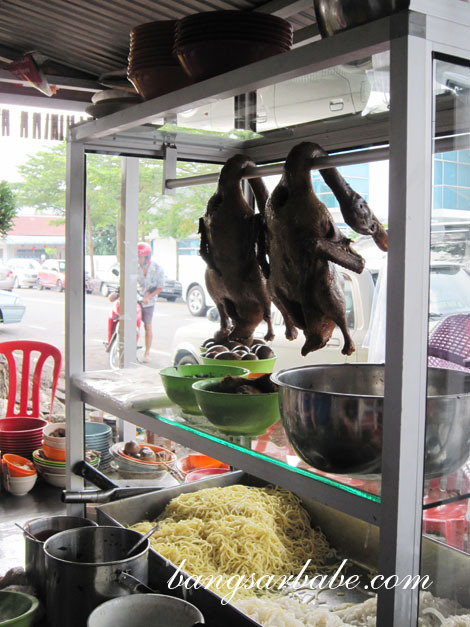 Ken spotted this stall selling braised duck web and wings in Jonker Street. Being the curious foodie he is, he ordered one to try. rif and the other Ken made a bolt because the sight of duck web made them squirm. To be honest, I was squirming inside because I’ve never eaten duck web before. It wasn’t as gross as I expected it to be, but I wouldn’t eat this again. 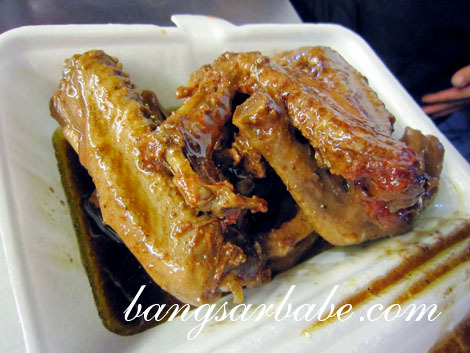 The chicken wings here (recommended by rif’s colleague) were seasoned with 5-spice powder and grilled till the edges are crisp. Tastewise, I found it just average as I prefer my chicken wings sticky-sweet. 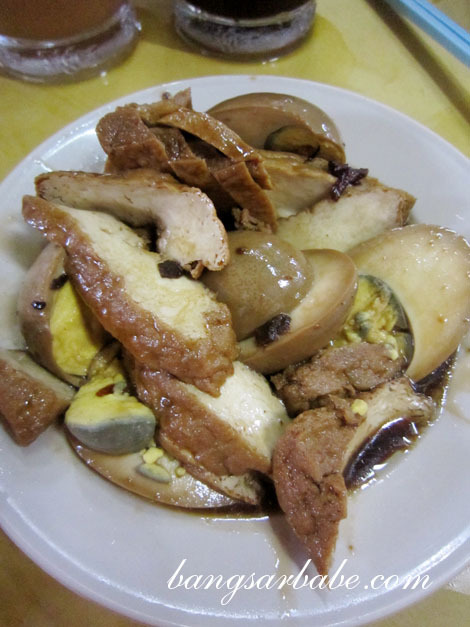 I didn’t care much for the Oh Chien either – the oysters were smallish and lacked flavour. 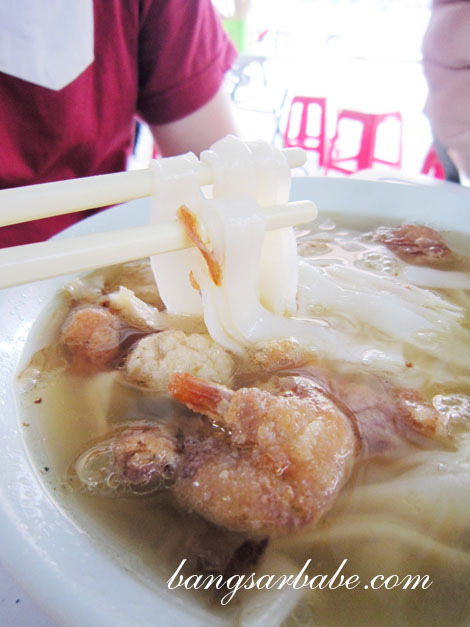 Soon Yen along Jalan Tengkera is known for the Malacca-style Duck Noodles and you have a choice of soup or dry noodles. 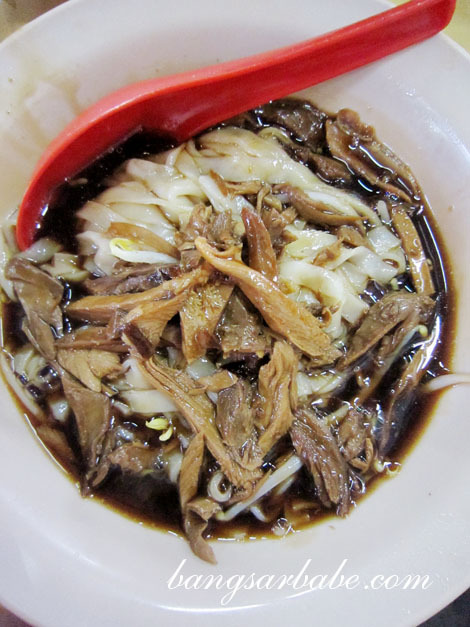 We opted for the dry noodles, tossed in thick gravy and topped with shredded duck meat. 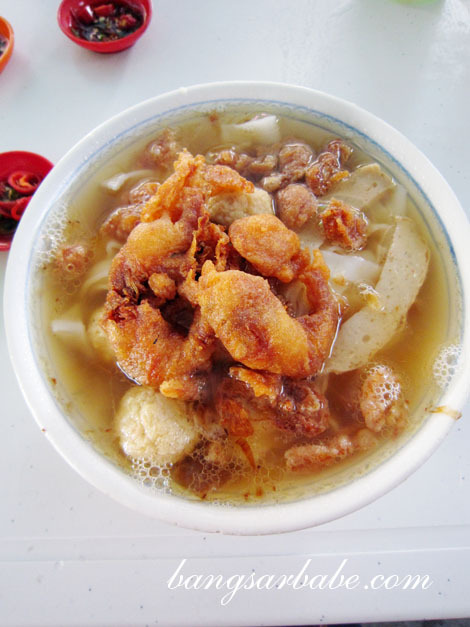 Ken asked for an add-on of braised beancurd and egg to eat with our noodles. 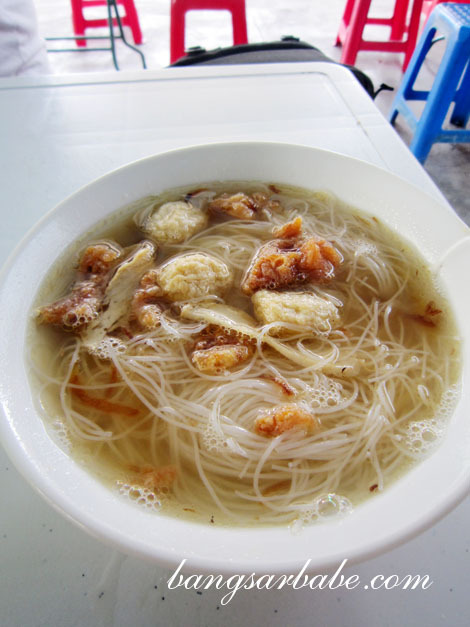 Between the kuay teow, yellow noodles and vermicelli, the vermicelli tasted best with the gravy. 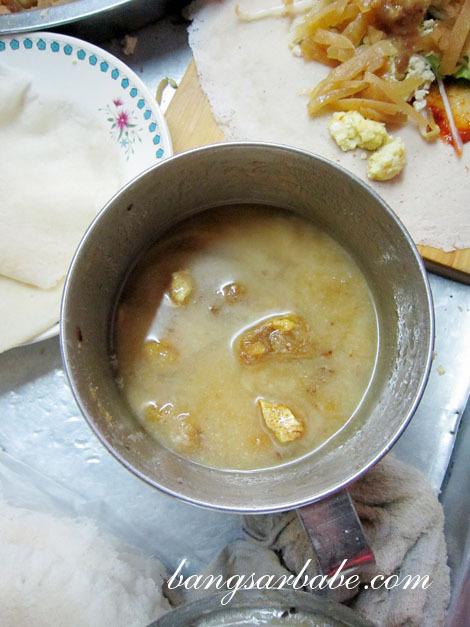 Skip the kuay teow as the “kan sui” taste affects the gravy. 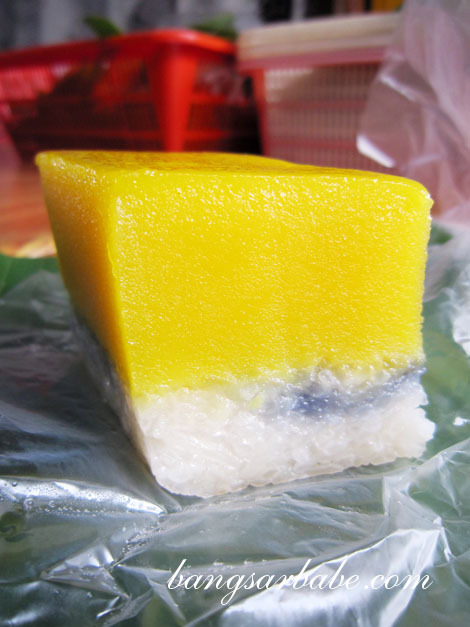 The Malaccan loh bak (RM10 – large) is a simpler version of the Penang loh bak. 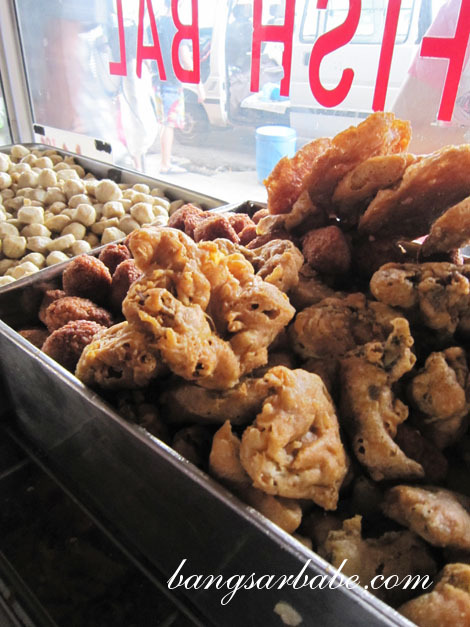 This comprised fish balls, fish skin fritters and prawn fritters and came with a side of sweet dipping sauce and chilli. We ordered another large plate to share. rif also ordered the fried carrot cake, which isn’t as good as the one from Jonker Street. Ken seemed smitten with the Tai Bak (ugggh) and wanted to try the tai bak from the stall next to Wesley Church. 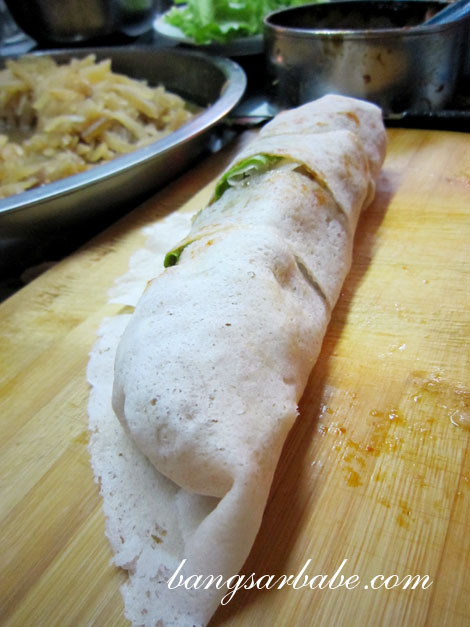 This was a huge disappointment – the flour noodles were bland and paste-y, while the sugar syrup has no pandan aroma or flavour. I tried the Kuih Badak and fried banana; the former was a snack that resembled a sui kow, but with bean sprouts and julienned carrots inside. Nothing special. 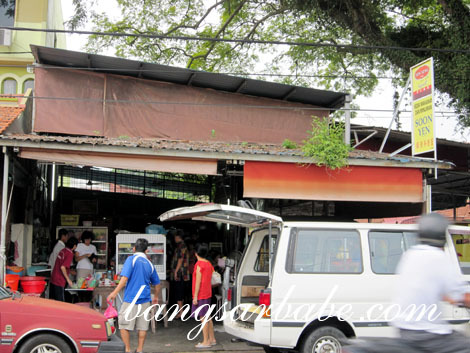 This is THE place to go to for durian cendol as they use only fresh durian, unlike the bogus version at Jonker 88. Read my blog post on Jeta Groves here. 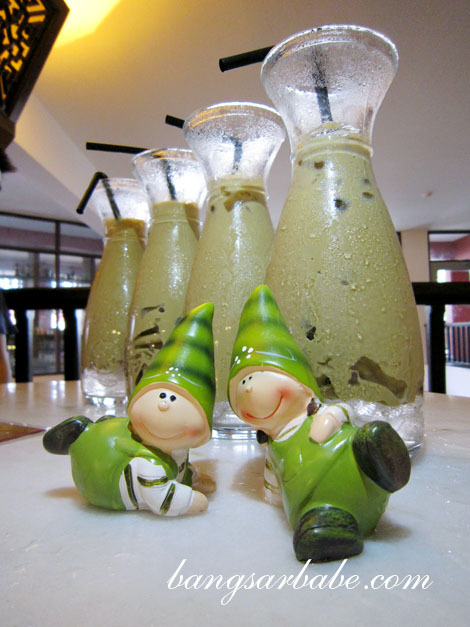 A tourist hangout place, but according to Ken, the Icy White Coffee is pretty good. I have to agree, although at RM5.80, it’s daylight robbery. 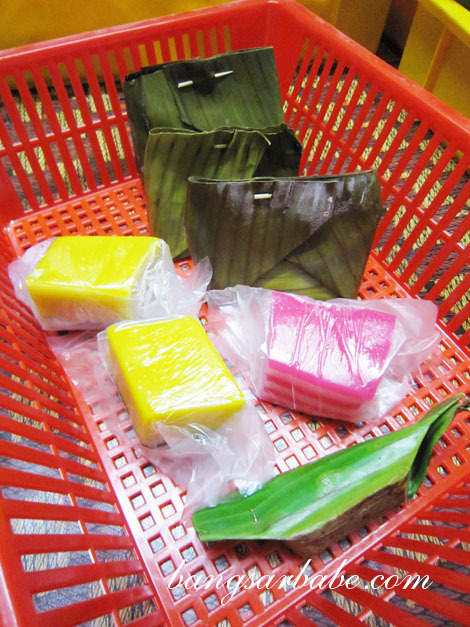 Stopped by Baba Charlie to tapau a few boxes of Nyonya kuih and 5 packets of nasi lemak. 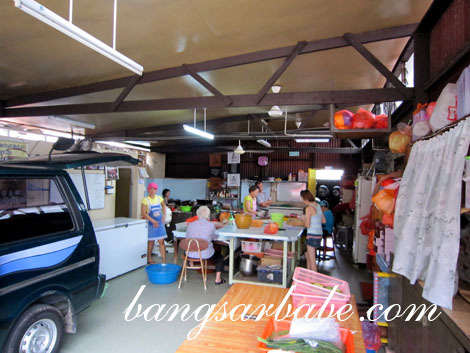 My favourite place to eat Nyonya Laksa in Malacca, the son runs the Bangsar outlet which I reviewed here. Read my blog post on Baba Low here. OMG! I just finish editing the photos and you are done! Faint … roll on the floor …. No Chicken Rice Ball? (or is it Chicken Ball Rice?) 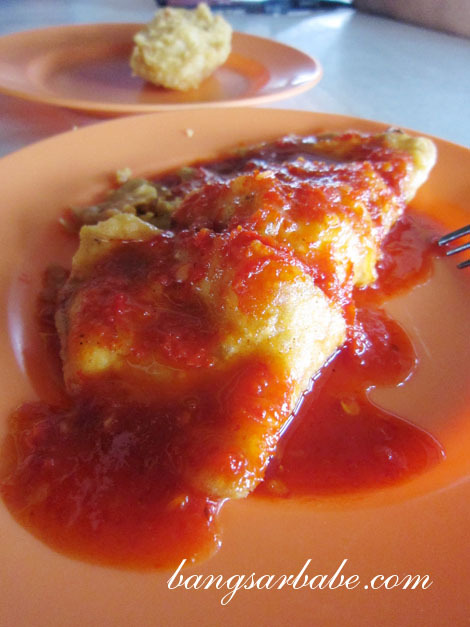 … I thought no makan trip to Melaka would be complete without it. Although at the risk of offending any Malaccans reading this I personally don’t really uh … think it’s anything special ha ha. Nope. 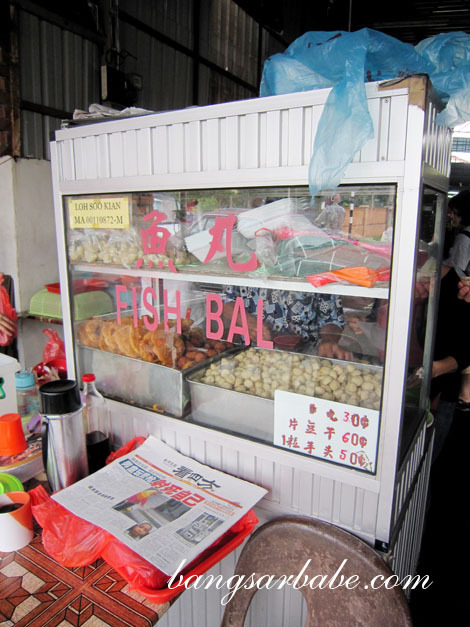 We didn’t want to waste stomach space and time on the chicken rice ball in Malacca. Overrated and it’s a tourist trap. i want to eat ahh..can even lick the screen!! Hahahaha! 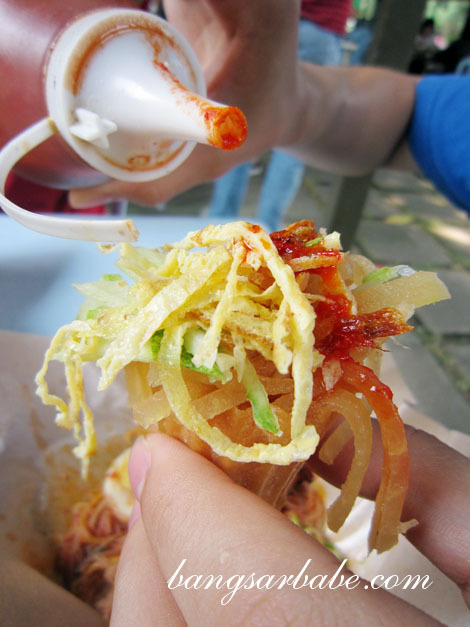 Satay celup is quite commercialized these days. I think standard has dropped too. Land of no food? Where?? Salute to both u & Ken, eat so much (which really a lot!) some food I’m not even know! Yah!! 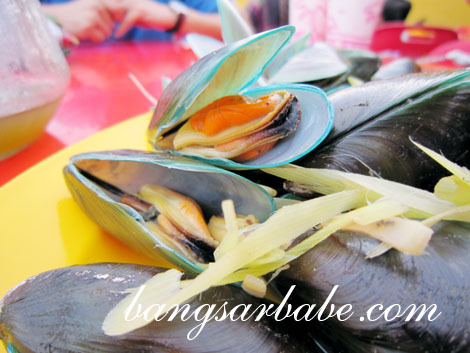 it’s really fun, there was one time, I was on a trip to Krabi, and I went to their pasar malam, tempted to try their local delicacies but my partner was telling me “you eat la, i don’t want, coz I am still very full from the dinner earlier” Arrghhhhhhh that was also after I have expressly inform him not to take a heavy dinner (provided by hotel) coz I wanna go to their local pasar malam to experience the local food! End up I just had a packet of their mango salad and forgoing all other interesting stuff! 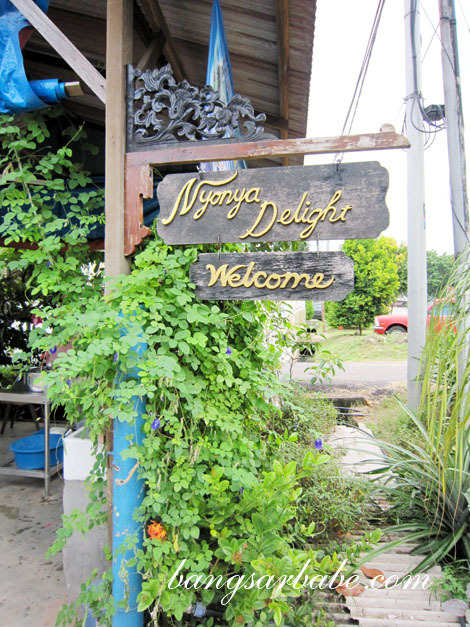 At 10am, you had ‘Kuay Teow Th’ng with fried prawn fritters’, then at 11.30am you took Nyonya Laksa. Do u really finish the whole bowl of noodle all by urself? Well written, bookmarked for future references. This is simply the best! How do you do it?Lol…I hope someday I can join you and Rif on a makan trip. ”How do you do it?” – is an Irish joke….lol. Seriously, there is no need for me to train, I’m ready!! lol… I have a ferocious stomach which needs feeding regularly!! I started waving the white flag a third of the way down the post. Where does it all go? 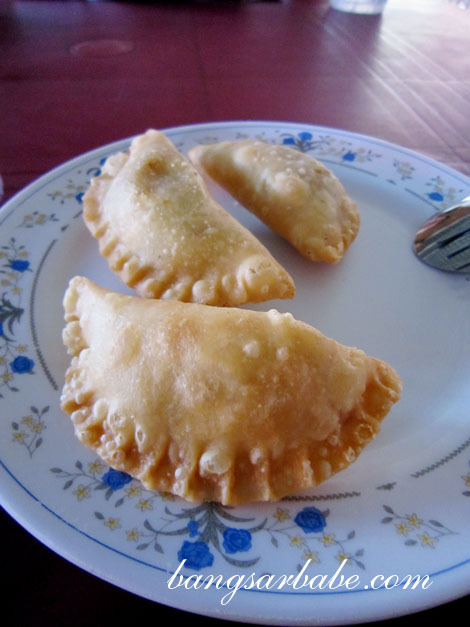 Gosh… I miss the tandoori and naan. Didn’t know there’s good kuey teow th’ng in Malacca. 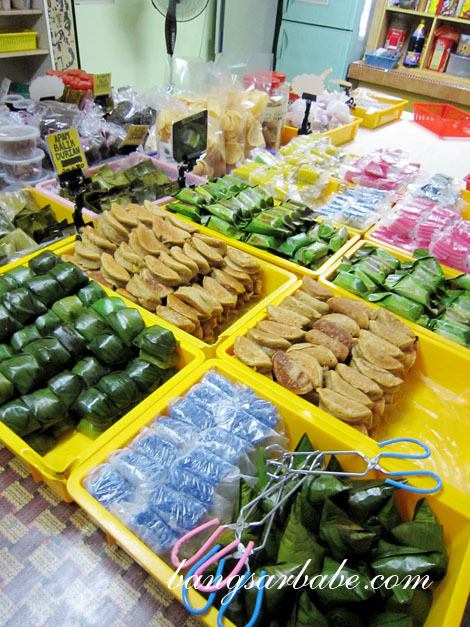 And the Nyonya kuih looks good too! how come u eat so much also so thin? hey, i love all those foods! will it be far away to all these areas from jonker ? if i takes taxi rides will it be very far from each other (place) ? Am glad I could help!